Amenhotep III 1390 – 1352 BC. Amenhotep III’s long reign of almost 40 years was one of the most pros­perous and stable in Egyptian history. His great-grandfather, Tuthmosis III, had laid the foundations of the Egyptian empire by his campaigns into Syria, Nubia and Libya. Hardly any military action was called for under Amenhotep III, and such little as there was, in Nubia, was directed by his son and viceroy of Kush, Merymose. 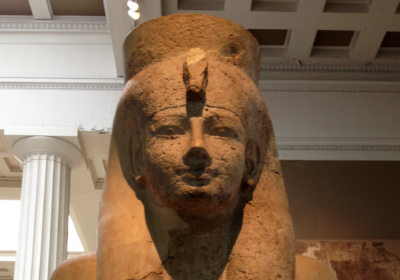 Amenhotep III was the son of Tuthmosis IV by one of his chief wives, Queen Mutemwiya. It is possible [though now doubted by some) that she was the daughter of the Mitannian king, Artatama, sent to the Egyptian court as part of a diplomatic arrangement to cement the alliance between the strong militarist state of Mitanni in Syria and Egypt. The king’s royal birth is depicted in a series of reliefs in a room on the east side of the temple of Luxor which Amenhotep III built for Amon. The creator god, the ram-headed Khnum of Elephantine, is seen fashioning the young king and his ka (spirit double) on a potter’s wheel, watched by the goddess Isis. The god Amun is then led to his meeting with the queen by ibis-headed Thoth, god of wisdom. Subsequently, Amun is shown standing in the presence of the goddesses Hathor and Mut and nursing the child created by Khnum. Amenhotep III’s reign falls essentially into two unequal parts. The first decade reflected a young and vigorous king, promoting the sportsman image laid down by his predecessors and with some minor military activity. In Year 5 there was an expedition to Nubia, recorded on rock inscriptions near Aswan and at Konosso in Nubia. Although couched in the usual laudatory manner, the event recorded seems to have been rather low key. An undated stele from Semna (now in the British Museum) also records a Nubian campaign, but whether it is the same one or a later one is uncertain. A rebellion at Ibhet is reported as having been heavily crushed by the viceroy of Nubia, “King’s Son of Kush”, Merymose. Although the king, ”mighty bull, strong in might, the fierce-eyed lion” is noted as having made great slaughter within the space of a single hour, he was probably not present; nevertheless, 150 Nubian men, 250 women, 175 children, 110 archers, and 55 servan a total of 740 – were said to have been captured, to which was added the 312 right hands of the slain. The last 25 years of Amenhotep III’s reign seem to have been a period of great building works and luxury at court and in the arts. The laudatory epithets that accompany the king’s name are more grandiose metaphen than records of fact: he took the Horus name ”Great of Strength who Smites the Asiatics”, when there is little evidence of such a campaign, similarly, ”Plunderer of Shinar” and ”Crusher of Naharin” seem singularly inappropriate, particularly the latter since one of his wives, Gilukhepa, was a princess of Naharin. The wealth of Egypt at this period came not from the spoils of con­quest, as it had under Tuthmosis III, but from international trade and an abundant supply of gold (from mines in the Wadi Hammamat and from panning gold dust far south into the land of Kush). It was this great wealth and the booming economy that led to such an outpouring of artistic talent in all aspects of the arts. Since the houses or palaces of the living were regarded as ephemeral, we, unfortunately, have little evidence of the magnificence of a place such as Amenhotep’s Malkata palace. Fragments of the building, how­ever, indicate that the walls were once plastered and painted with lively scenes from nature. Many of the temples he built have been destroyed too. 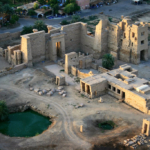 At Karnak he embellished the already large temple to Amun and at Luxor he built a new one to the same god, of which the still standing colonnaded court is a masterpiece of elegance and design. Particular credit is owed to his master architect: Amenhotep son of Hapu. On the west bank, his mortuary temple was destroyed in the next (19th) dynasty when it, like many of its predecessors, was used as a quarry. All that now remains of this temple are the two imposing stat­ues of the king known as the Colossi of Memnon. (This is in fact a com­plete misnomer, arising from the classical recognition of the statues as the Ethiopian prince, Memnon, who fought at Troy.) Of the two, the southern statue is the best preserved. Standing beside the king’s legs, dwarfed by his stature, are the two important women in his life: his mother Mutemwiya and his wife, Queen Tiy. A quarter of a mile behind the Colossi stands a great repaired stele that was once in the sanctuary and around are fragments of sculptures, the best of which, lying in a pit and found in recent years, is a crocodile-tailed sphinx. Some magnificent statuary dates from the reign of Amenhotep III such as the two outstanding couchant rose granite lions originally set before the temple at Soleb in Nubia (but subsequently removed to the temple at Gebel Barlzal further south in the Sudan). 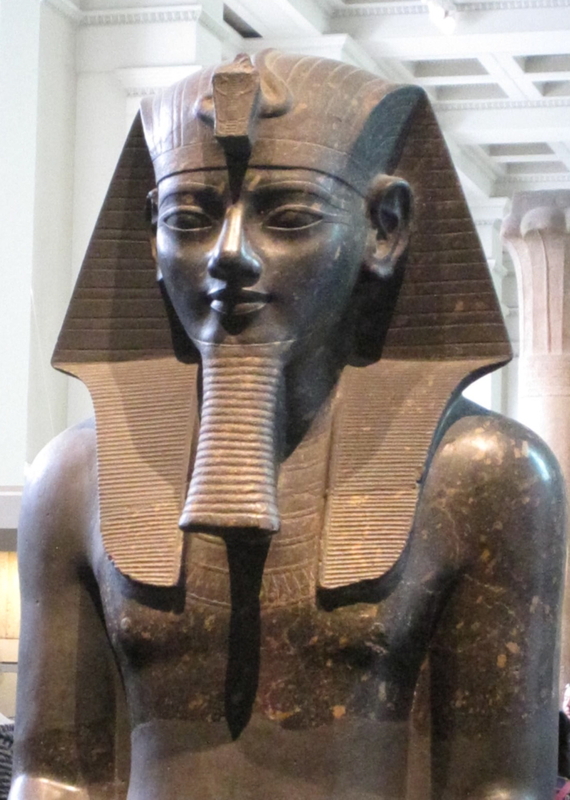 There is also a proliferation of private statues, particularly of the architect Amenhotep son of Hapu, but also of many other nobles and dignitaries. It is in the great series of royal portraits, however, that the sculptor’s art is truly seen. Largest of them all (after the Colossi of Memnon) is the huge limestone statue of the king and queen with three small standing princesses from Medinet Habu. There are many other representations of the king, all of which project the contemplative, almost ethereal, aspect of the king’s features. Magnificently worked black granite seated statues of Amenhotep wearing the nemes headdress have come from excavations behind the Colossi of Memnon (by Belzoni) and from Tanis in the Delta. A number of statues of the king were reworked by later rulers, often by simply adding their cartouches, or occasionally altering the features or aspects of the body, as with the huge red granite head hitherto identified as being Tuthmosis III from Karnak (also found by Belzoni) and reworked by Ramesses II [now in the British Museum). Several portraits in statues, reliefs and wall paintings show the king wearing the helmet-like khepresh, the so-called Blue or War Crown. One of the most incredible finds of statuary in recent years was made in the courtyard of the Amenhotep III colonnade of the Luxor temple in 1989. It included a superb 6-ft (1.83-m) high pink quartzite statue of the king standing on a sledge and wearing the Double Crown. The only damage the statue had sustained was under Akhenaten when, very carefully, the hated name of Amon was removed from the cartouch when it appeared as part of the king’s name. The inscriptions on the statue and its iconography suggest that it is a work from late in the despite the idealized youthful features of the king. It may possibly have been a cult statue. The two most widely known portraits of Queen Tiy are the small ebony head in Berlin which, in the past, caused many authorities to sug­gest that she came from south of Aswan, and the petite-faced and crowned head found by Petrie at the temple of Serabit el-Khadim in Sinai which is identified as the queen by her cartouch on the front of her crown. Other fine reliefs of her come from the tombs of some of the courtiers in her service such as Userhet (TT 47) and Kheruef (TT 192). Inscribed clay dockets from the Malkata palace carry dates into at least Year 38 of Amenhotep’s reign, implying that he may have died in his 39th regnal year when he would have been about 45 years old. His robbed tomb was rediscovered by the French expedition in 1799 in the western Valley of the Kings (KV 22). 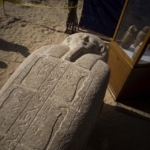 Amongst the debris, they found a large number of ushabtis of the king, some complete but most­ly broken, made of black and red granite, alabaster and cedar wood. Some were considerably larger than normal. Excavations and clearance by Howard Carter in 1915 revealed foundation deposits of Tuthmosis IV, showing that the tomb had been originally intended for that king. Despite this, the tomb was eventually used for Amenhotep III, and also for Queen Tiy to judge from the fragments found of several different ushabtis of the queen. 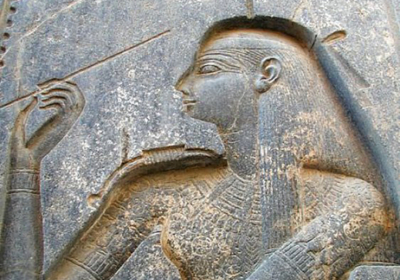 Queen Tiy survived her husband by several years – possibly by as many as 12, since she is shown with her youngest daughter, Beket­ Aten, in a relief in one of the Amarna tombs that is dated between Years 9 and 12 of her son’s reign. (Beket-Aten is shown as a very young child and must have been born shortly before Amenhotep died, or even posthumously.) We know from polite enquiries about Tiy”s health in the Amarna Letters (p. 126) that she lived for a while at Akhetaten (modern el-Amarna), the new capital of her son Akhenaten. It has been suggested that there was a period of co-regency between the old king and his successor, but the argument is not proved either way. An inter­esting painted sandstone stele found in a private household shrine at el-Amarna shows an elderly, rather obese Amenhotep III, seated with Queen Tiy. Whether he actually lived for a time in this city is a matter of conjecture; Tiy certainly did and may well have died there, to be taken back to Thebes for burial. Amenhotep III’s mummy was probably one of those found by Loret in 1898 in the tomb of Amenhotep II (KV 35), although recently it has been suggested that this body was wrongly identified by the ancient priests when it was transferred to the new tomb. On biological grounds, profes­sors Ed Wente and John Harris have proposed it to be the body of Akhenaten, or possibly Ay. A previously unidentified female mummy (the Elder Woman) from the same cache has been tentatively identified as Queen Tiy, based on the examination of her hair and a lock of hair in a small coffin from the tomb of Tutankhamun inscriptionally identified as Tiy”s.